Malco’s SL1R Sheet Metal Snap Lock Punch raises a louvered shaped projection on metal edges for locking into a rolled edge of sheet or piece to be joined. Metal pieces snap together and are fastened securely. The heavy forged cutting jaw has a rust resistant nickel plate and black oxide finish. 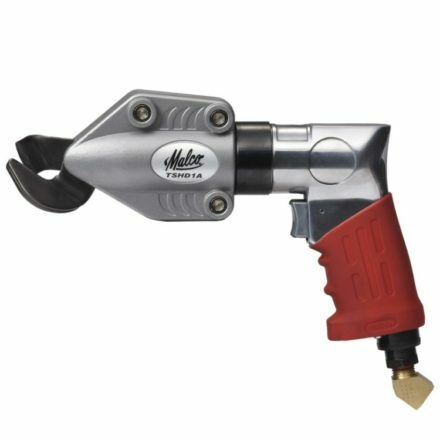 The Malco Sheet Metal Snap Lock Punch also features ergonomic RedLine Handle technology. An Engineered handle opening compliments the natural power stroke of any user’s hand and maximizes the powerful 7:1 mechanical advantage of compound-leverage head to handle linkage. Comfortable handle grip contours, a non-slip grip insert, spring handle actuation and a thumb-operated handle latch ensure a natural fit and feel for comfortable one hand operation anywhere on the job. Create your own locking tabs for sheet metal duct corners.